Continuing its crackdown on extremist groups and madarsaas, the Pakistan police today detained more 100 persons in the search for clues to the London bombings as the main Islamist alliance geared up to launch nationwide protests against the government’s campaign. Pakistan and the UK have agreed to cooperate in the war against terrorism and exchange information and intelligence against the terrorists involved in the recent London bombings. 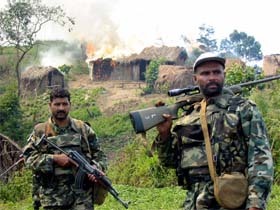 Pakistani United Nations Peacekeepers keep watch over a Rwandan rebel camp they had raided and burnt in the South Kivu province, eastern Democratic Republic of Congo, on Wednesday. Chinese military experts have lashed out at Pentagon’s annual report on China’s military modernisation saying it was full of “guesswork and prejudices” and reflects the animus of certain forces in the US toward its “peaceful rise”. North Korea is willing to resolve a crisis over its nuclear arms programme at next week’s six-party talks in Beijing, but said normalising relations with Washington was key to a deal, Chinese state media reported today. HAVING cruised to victory last November and breezed through his reinauguration, President Bush seems suddenly to have fallen victim to the curse of the second term. Like Presidents Nixon, Reagan and Clinton before him, he is being damaged by something that looks on first acquaintance like a niggling little detail, but swiftly grows into a full-blown threat to the President. The British police arrested four men under anti-terrorism laws but said there was no link to the July 7 London bombings. The police arrested the men in a car in the city of Stoke in Central England after a telephone call from a member of the public who thought they were acting suspiciously. Astronomers in the US have discovered a dust enshrouded star located 300 light years from the earth which looks like a sun. Unlike hundreds of other stars covered with dust, where the dust is far from the star -- equivalent to beyond the orbit of Pluto -- this dust is orbiting close to the star, says science portal www.eurekalert.org, quoting from Nature magazine. NASA has said it had set a new tentative launch date for the shuttle Discovery of July 26 at 10.44 am local time (2014 IST) from the Kennedy Space Centre near Cape Canaveral in Florida. Actor James Doohan, best known as the feisty, Scottish-accented chief engineer on television’s original “Star Trek” series — a role immortalised by the catchphrase “Beam me up, Scotty” — died yesterday at age 85, his manager said. As over 300 persons were detained in the nationwide campaign, Prime Minister Shaukat Aziz defended the arrests, saying they were aimed against extremist elements and part of the fight against terrorism and in the national interest which would ensure peace in the country. Hundreds of clerics and students, including those from seminaries frequented by the three Pakistan-origin London bombers, were detained in raids across the country, media reports said. Muthahida Majlis Amal (MMA) announced yesterday that it would hold nationwide protests during Friday prayers and accused President Pervez Musharraf of launching the crackdown to “please” the leaders of western countries in the aftermath of the 7/7 London bombings. Foreign Office sources here said the British Prime Minister discussed with General Musharraf the situation arising from the 7/7 London bombings and strategy to effectively fight global terrorism in a telephonic conversation yesterday. Mr Blair was all praise for Pakistani security and intelligence agencies for helping the British agencies in tracing terrorists behind the London bombings. He said terrorism was a global issue, which required international efforts to combat the menace. The British Prime Minister appreciated Islamabad for cracking down on militant outfits and seminaries fanning extremism and sectarianism, and assured every possible cooperation from London to fight terrorism. President Musharraf said Pakistan would continue to cooperate with Britain in London blasts probe and would share intelligence and information on the same. Although some people in the US wantonly play up “Chinese military threats” in the report, it won’t have any obvious influence on Sino-US relations and China’s military modernisation won’t slow down for it, the experts said. “The report issued by the Pentagon on July 19 shows some forces in the US military sector still view China’s peaceful rise with cold war mentality,” a research fellow with the Chinese Academy of Military Science, Shi Yan said. The Pentagon report, originally scheduled to be released in April or May, was repeatedly postponed for various reasons, the experts were quoted by the official Xinhua news agency as saying. “Its difficult birth indicates that this is not an objective research report,” naval expert Li Yaqiang. “If it is entirely based on facts, why should it be postponed and revised again and again. Generally, only conjectures are prone to revisions.” Chinese Vice-Foreign Minister, Yang Jiechi, on behalf of the Chinese government, summoned David Sedney, charge d’affaires of US embassy in China, yesterday and lodged a protest with the US government against the contents of the Pentagon report. Yang said the report “groundlessly criticises” China’s defence modernisation drive, and “makes unwarranted charges” on China’s normal defence development and military deployment. “Not a single nuclear weapon will be needed for us if the US nuclear threat is removed and its hostile policy of ‘bringing down the DPRK’s system’ is withdrawn,’’ the official Xinhua news agency quoted an unnamed North Korean Foreign Ministry spokesman as saying. The niggling detail that Mr Bush and his White House staff have so far been unable to swat away is Valerie Plame, the CIA agent whose cover was blown after her husband, a former diplomat, displeased the President. Ms Plame has remained silent. Her husband, Joseph Wilson, however, has made no secret of his belief that his wife's identity was deliberately leaked by the White House in a petty act of revenge. Mr Bush's difficulties stem from three awkward facts. The first is that knowingly to reveal the identity of an undercover agent is a crime in US federal law. The second is that the answer to the standard question - who benefits? - would strongly implicate the White House. And the third is that the man the investigation is closing in on is Mr Bush's closest adviser, Karl Rove, the tactical genius to whom he owes his re-election. As with previous second-term presidents, the actual episode that gave rise to Mr Bush's current discomfiture took place towards the end of the first term. And it is legitimate to ask whether, had America known then even the skeletal details it knows now, Mr Bush's re-election would have been so smooth. Indeed, there must be a strong suspicion that Mr Bush approved the appointment of a special prosecutor in the hope of delaying the emergence of any unpalatable revelations. Special prosecutors have a habit of taking their time. But precedent shows that, once appointed, they take their responsibilities seriously. And Patrick Fitzgerald is no exception. He has already elicited an admission from Karl Rove's lawyer that Mr Rove confirmed Ms Plame's identity to a reporter. Two journalists have given information and a third is serving a four-month prison term for refusing. Most damaging of all, Mr Bush, through his spokesman, has been forced first to retreat into embarrassed silence and then to back-track. Having initially said that the leaker would have no place in his White House, he now says that anyone found to have committed a crime will be removed. However much his spokesman insists otherwise, this is not the same thing. The Bush White House is now in full defensive mode — By arrangement with The Independent, London. The British police arrested four men under anti-terrorism laws but said there was no link to the July 7 London bombings. The police arrested the men in a car in the city of Stoke in Central England after a telephone call from a member of the public who thought they were acting suspiciously. “In what we must stress was a spontaneous incident which we reacted to, four men in the vehicle were arrested under the Terrorism Act 2000,” a police spokeswoman said in a statement yesterday. Astronomers in the US have discovered a dust enshrouded star located 300 light years from the earth which looks like a sun. Unlike hundreds of other stars covered with dust, where the dust is far from the star -- equivalent to beyond the orbit of Pluto -- this dust is orbiting close to the star, says science portal www.eurekalert.org, quoting from Nature magazine. "What is so amazing is that the amount of dust around this star is approximately one million times greater than the dust around the sun," said Eric Becklin, a professor of physics and astronomy, a member of NASA's Astrobiology Institute, and co-author of the Nature paper. The extraordinary nature of the dust indicates a violent history of cosmic collisions between asteroids and comets, or perhaps even between planets. "It's likely there was a cosmic catastrophe, and a time of heavy bombardment, where large asteroids collided in the last few thousand years or less. It's incredible what must be going on," said Becklin. The US space agency scrubbed a planned lift-off on July 13 after a glitch occurred in one of the Discovery’s fuel gauge systems during launch preparations. “Right now, we think we have eliminated all possible causes related to the glitch”, launch programme director Bill Parson told reporters in a televised press conference. Doohan died at his home in the Seattle suburb of Redmond, Washington, of complications from pneumonia and Alzheimer’s, about a year after he was diagnosed with the illness, manager Steve Stevens said in an interview.